One of a kind prototype of the Kensington with front hub motor, coaster brake, 8-speed nexus hub gears and European set up. 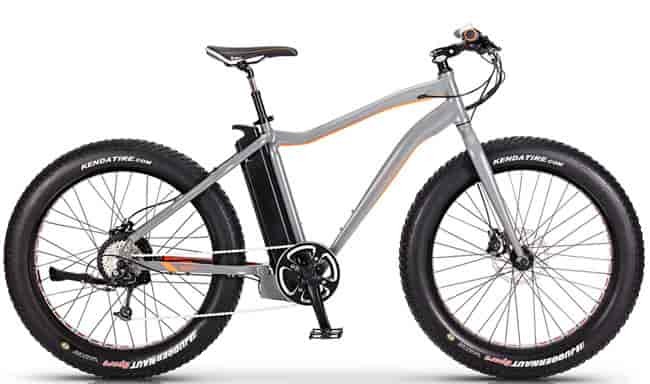 Although this is a brand new ebike, it presents some scratches from being moved around the showroom. 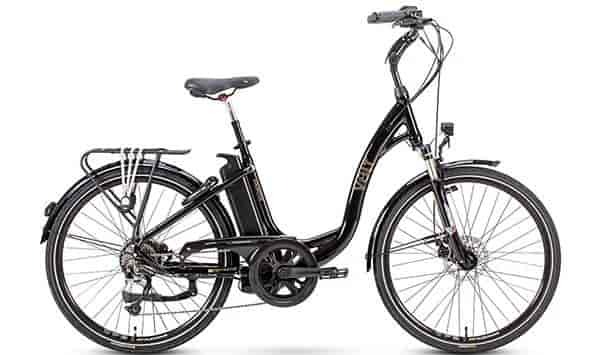 One of the most stylish e-bikes on the market, the Kensington is built for comfort and elegance. 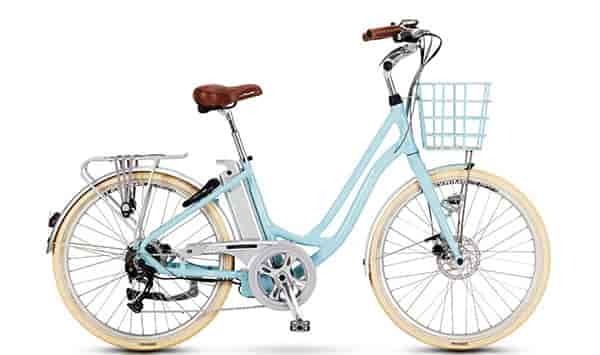 A 17 inch, step-through frame makes the Kensington accessible to riders of all heights. 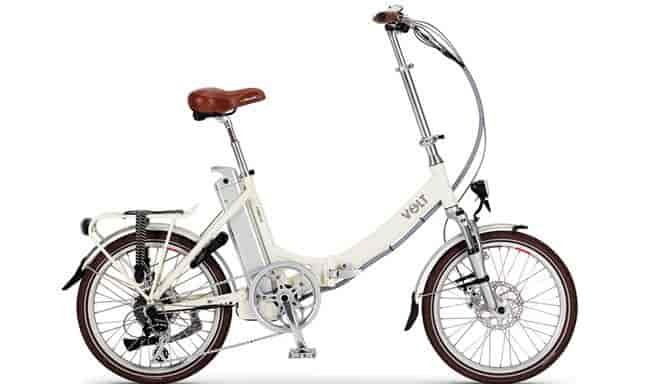 Available in a cool white or an attractive blue this bike is very easy on the eye and has captured the attention of the British media too. 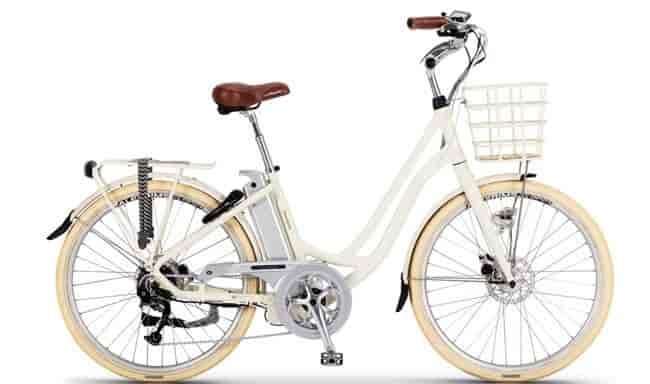 With appearances in T3 magazine's “Good Gift Guide” as well as Total Women's Cycling's best electric bike two years in a row, it's a clear winner with the press and public alike! Featuring components of the highest quality, you are assured not only the smoothest riding experience in town but one that will stand the test of time. 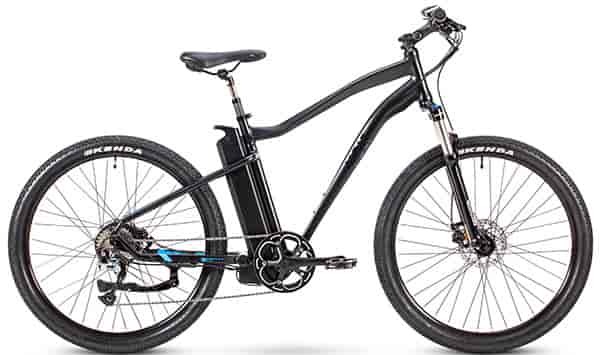 The 250W Bafang Power Motor and Panasonic Lithium Polymer battery deliver pedal assistance up to and beyond 60 miles on one charge. 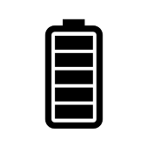 You can change the level of powered assistance, choosing between 5 different levels delivered by VOLT's own V-Wave Technology system. 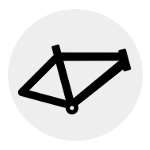 The system is an intuitive program that reacts to the individual's cycling style to perform a seamless cycling experience. If you prefer to have periods without any powered assistance that can also be achieved at the touch of a button, making it easy for you decide the amount of work you want to put into your ride. In the specifications area you'll see that the Kensington is fitted with the best and most sophisticated parts around. 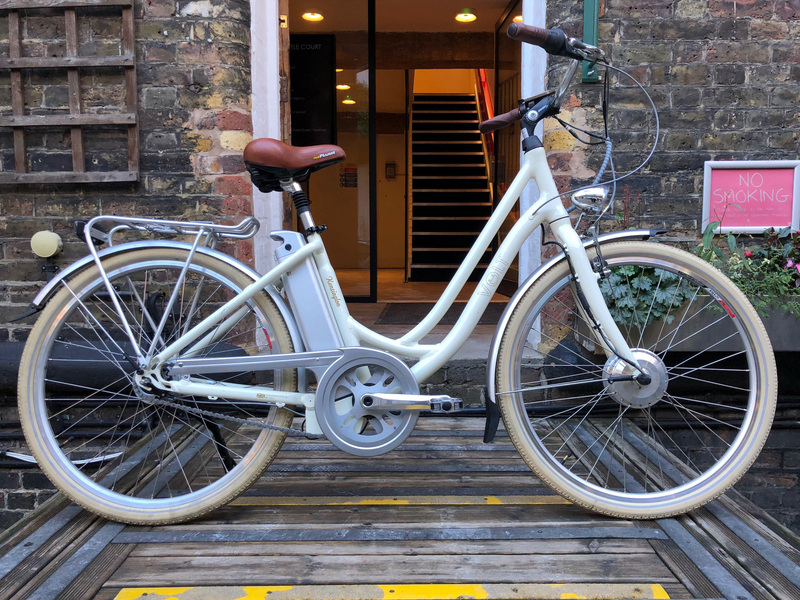 The pannier rack, mud guards and lights, not only add to the visual appeal of this great looking e-bike, but they will prove extremely useful in its day to day cycling too. 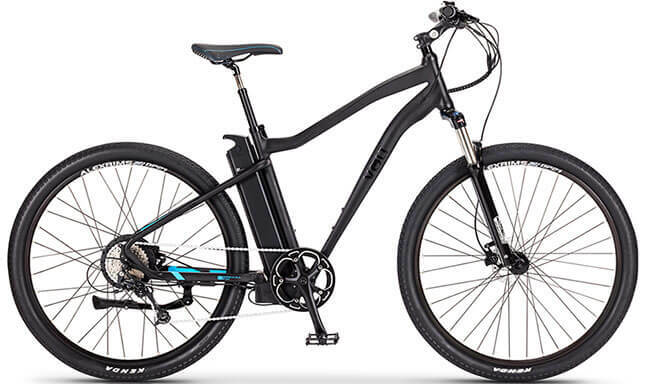 We know you'll love this electric bicycle. The Kensington comes with a one year peace of mind warranty and its reviews speak for themselves. Why not find out for yourself? 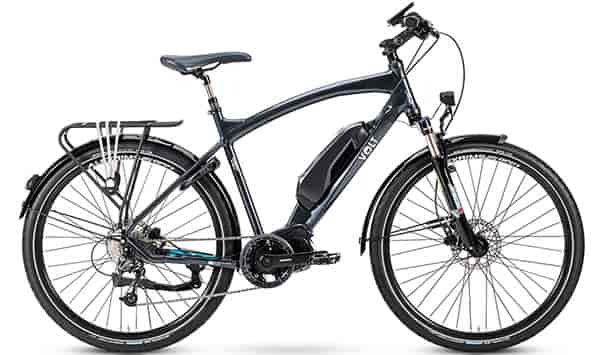 Start your e-bike adventure and arrange a test ride today. 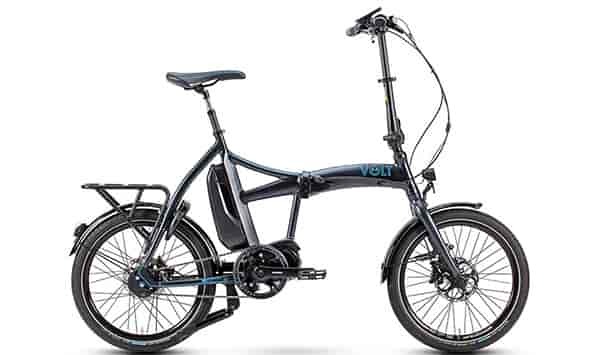 "I purchased a VOLT™ Pulse E-bike and my wife purchased the Kensington E Bike we are thoroughly pleased with these bikes and would recommend anyone to buy these bikes"
"I bought 2 VOLT™ Kensington bikes for my and I. We are both in our 60's and had not been on bikes for years. Our first trip was to take them with us on a tour though France. They are amazing ! We have enjoyed cycling around medieval villages and on the many countryside cycle tracks in France. The true test was when we arrived at our holiday home in Provence which is at the top of a very steep hill over a mile long. With some trepidation we decided to give it a go and we're delighted that the bikes got us comfortably up the hill without expending too much effort. Just as well because it was 30 degrees. 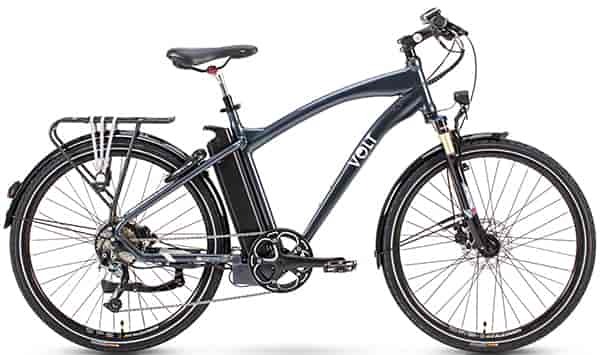 The staff at VOLT™ are also great to deal with and pulled the stops out to have our bikes delivered at short notice. The French have an eye for style and love them too. Lots of admiring looks and comments." 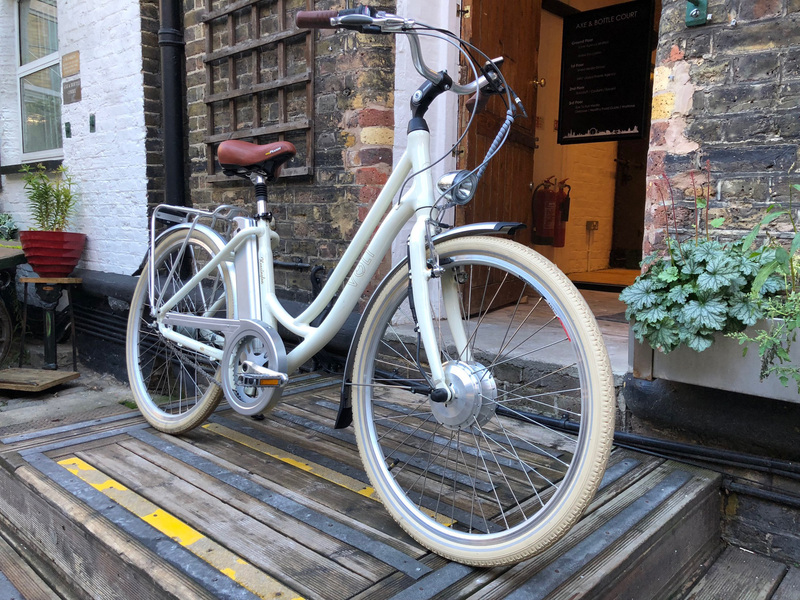 "My VOLT™ Kensington e bike has put the pleasure back into cycling for me, as I am now a senior citizen and finding some hills a struggle, but now I am first up any hill and enjoying every moment of it, I wave to my husband as I pass him by." 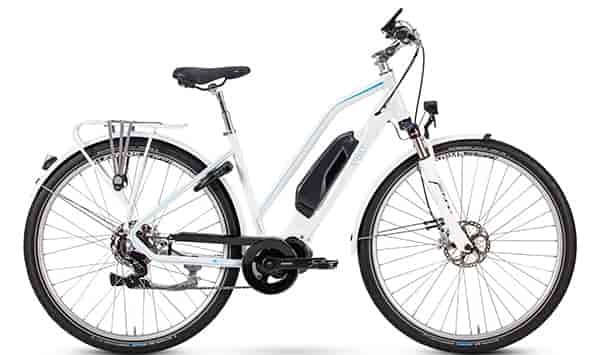 "My partner and I bought two Giant electric bikes 3 and 4 years ago. We thought they were fantastic but, when we changed from a motor home to a caravan, they were too heavy to lift into caravan. Initially, I sold mine and bought a Batribike. Had several problems straight away and shop gave me my money back. Then I bought my VOLT™ Kensington. Absolutely love it!! When my partner rode it back from somewhere and I took the car, he wanted one. After selling his Giant, he bought the Pulse and much prefers it to his Giant. Would highly recommend these bikes. Just come back from doing 25 miles, my partner towing our doggy hut behind his." 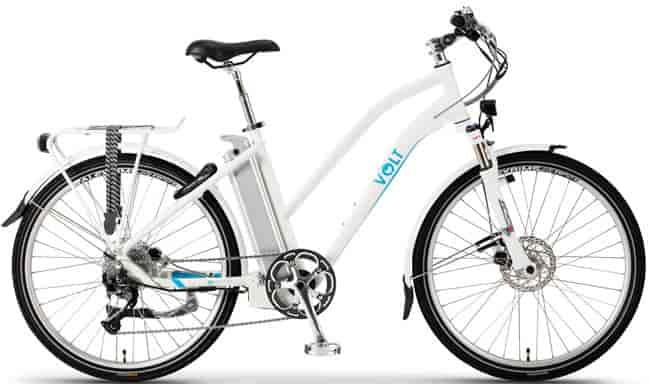 "Absolutely delight with the purchase of my new VOLT™ Kensington bike. 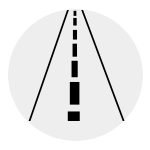 Very easy to use, but best of all hills are almost non existent. I love going out with the rest of my family cycling in the beautiful countryside with the lovely wind on my face. My family are also delighted with my purchase as they alway ready to have a ride on the Kensington. 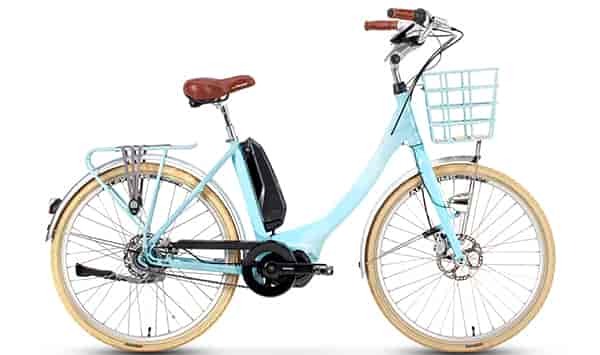 I debated over several months if the Kensington would be the bike for me but I can honestly say l have no regrets"
"I have rarely enthused so much about anything in my life. I have a Kensington step-through and can't recommend it highly enough. 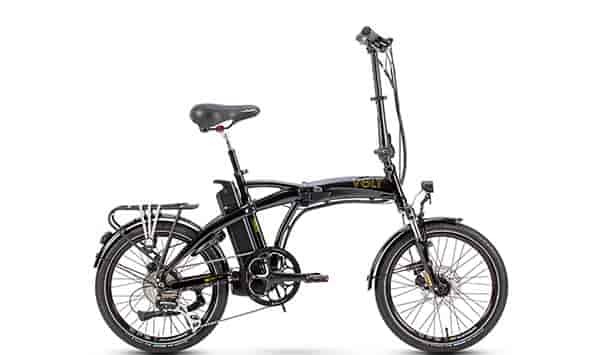 I used to cycle to work daily but with a steep hill and wind tunnel between home and office gradually gave in to the internal combustion engine. Now I choose to cycle, even if a lift is on offer, and have been known to complain that my commute is too short. I would suggest a couple of minor design tweaks: the on/off button on the battery is sometimes a little tricky to switch on and the battery fits so tightly it is sometimes difficult to pull out of its 'socket'. These are minor details though." 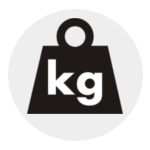 "I have had my Kensington about eight months now, and it's been worth every penny. I live in a very windy spot with mostly undulating if not downright hilly terrain (and no dedicated bike paths). Before the Kensington, rides were rarely more than a couple of miles and were too much effort to be pleasurable. Now I generally go for 25 mile runs, often on minimal assist, and it's just sheer pleasure. 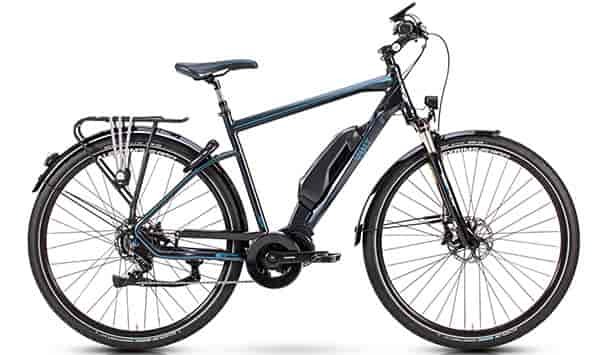 It's sturdy and stylish - well balanced and while heavier than a standard bike, it's light enough to be easy to lift into the shed for storage. 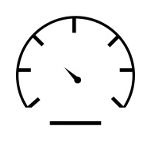 Plenty of assistance options from none (just using the display as a speedometer) to minimal assist for low gear slower inclines through to something that will get you up a hill with ease. Even removing the battery to charge (and for security) after each trip, it's the job of a minute to slide it back and replace the saddle. Quite a few people have commented on it when I've been parked up, and it's been easy to give it unreserved praise." 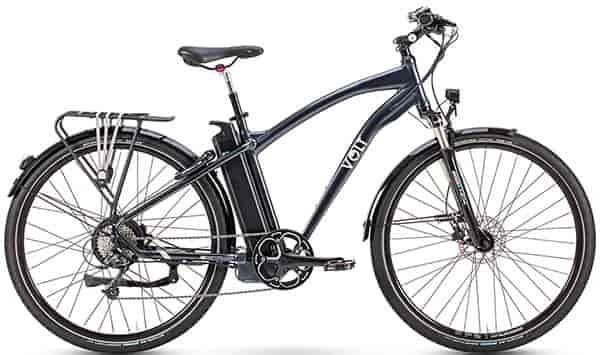 "Bought a VOLT™ Kensington for a 12 mile-a-day commute. In my forties and 20lbs overweight so hoping this will help. Lyle and his company were fantastic. I emailed them to say I needed Friday or Saturday delivery and they suggested they deliver to a local bike shop and pay them to set it up for me. I live virtually opposite Lockes in Sandwich so this made a huge amount of sense. VERY happy with my bike. Paired with a set of Red & Black "Ortlieb City Rear Roller" panniers it really looks "the business". Pleased to say you still have to put some effort in to maintain a steady 25km/h - but the motor is amazing - really puts a smile on your face - and the ability to cruise on the thumb-throttle whilst you get your breath back is great. Also can admit I enjoyed overtaking some racing bikes on a hybrid as an overweight 40-something perhaps a little too much :-) Great product. Great company. Highly recommended if you can afford it - can't see how you would be disappointed."